Most dogs live happily and peacefully with other dogs and people. However if a dog does show aggression it can be very worrying for all concerned. Recent changes in legislation also mean that owners run the risk of being criminally responsible if their dog behaves aggressively towards another person. So how can dog aggression be prevented and what can an owner do if their dog starts to show aggression, whether to dogs or to people? The first step to preventing aggression is to understand what it is. In everyday conversation, aggression is usually used to describe any behaviour that either threatens or causes injury, such as lunging and barking, growling, snarling or snapping as well as biting. However, there are different types of aggression in dogs, and in many cases this sort of behaviour is in fact the dog's way of trying to avoid causing or being injured. We therefore need to look a little deeper at what aggression is and what causes it if we are to prevent it. There are two very different types of dog aggression - 'predatory aggression' and 'emotional aggression'. Aggression that involves chasing, catching and killing smaller animals is usually predatory. Predatory aggression is generally very quiet, to avoid alerting the prey to the dog's presence. Some dogs may also stalk or approach very slowly so they can get as close as possible before starting to chase. However this depends on how much breeding has affected their normal predatory behavior. Predatory aggression isn't linked 'fight or flight' behavior, and so whilst the dog is usually very excited he isn't fearful or distressed. Instead predatory aggression triggers pleasure similar to that experienced when eating. Therefore, whilst the behavior needs to be controlled, we also have to accept it is a normal part of the dog's behavior. Alternatively, aggression used to protect something is referred to as 'affective' or emotional aggression. Dogs may use this to protect themselves or a member of their social group, especially offspring. They may also use it to protect something of value to them such as food, toys, a territory or a person they rely on for food or protection. In many cases they are reacting to a real threat such as when another dog attacks them or a human uses excessive punishment. However dogs can also interpret a situation as threatening even when it isn't, perhaps due to past experience or misinterpretation of the other's behaviour. This can make their behaviour seem unpredictable or unprovoked. However, there is invariably a trigger for it if we dig deep enough, even if it is due to a misunderstanding or the expectation of threat from another even though it wasn't intended. Emotional aggression differs from predatory aggression in that it includes a great deal of communication, including noise such as growling or barking. 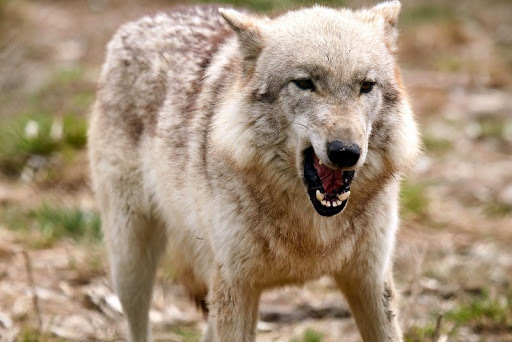 The dog may also snarl, lunge or snap before they bite. These behaviours are all intended to try and get rid of the threat. As such the majority of the behaviour described as 'aggressive' using the everyday definition is in fact communication, intended to avoid the situation escalating to the point where they may be injured. What influences whether a dog will use aggression? There are many influences over a dog's use of aggression. Behaviour, and therefore aggression, may be affected by the dog's physical state, such as their health, being in pain, breeding cycles, age and some medications. Genetics is also important. Most breeds were originally developed for behavioral traits so this will have some influence on how they behave in certain situations. For example the Border collie is bred to stalk and chase but not to kill the sheep and so is unlikely to show these aspects of predatory aggression to small animals. Other breeds have been bred to show higher aggression when protecting their territory or were originally bred for fighting. However to what degree breed traits are seen in a particular dog depends on its individual combination of genetics, experience and handling and so breed is not a reliable predictor of a dog's likely use of aggression alone. All of a dog's experiences from conception onwards will also influence how they behave. For example if a dam is stressed during pregnancy this may affect the puppy's reaction to stress and so use of aggression in later life. A puppy's experiences during his first 13 weeks or so also play a huge part in their development, including how they cope with new things or react when scared. In fact every experience throughout their life has the potential to affect how the dog reacts in the future. In the case of aggression this is particularly relevant where a dog has had frightening experiences or has been punished in a way that makes people seem scary or unpredictable. Whether the dog's physiology and experiences will come together to trigger aggression then depends on what is happing around them. For example if a dog didn't get the chance to meet lots of people as a young puppy and so is worried by those that perhaps look different to his owner, or if he has been badly treated by someone of a particular appearance, this is still only likely to trigger the dog to bite if that type of person approaches him in a way the dog finds worrying, fails to spot the signs he wants them to back away and the dog cannot escape. This is when the complex combination of influences that control the dog's use of aggression can come together to create the 'perfect storm' that leads to a bite.